Set of 6 Flexible Cutting Boards -- Awesome Reviews ONLY $3.49 SHIPPED! Set of 6 Flexible Cutting Boards — Awesome Reviews ONLY $3.49 SHIPPED! Clip the extra $1 off coupon plus apply code PHF6P8TP. Price falls to $3.49! 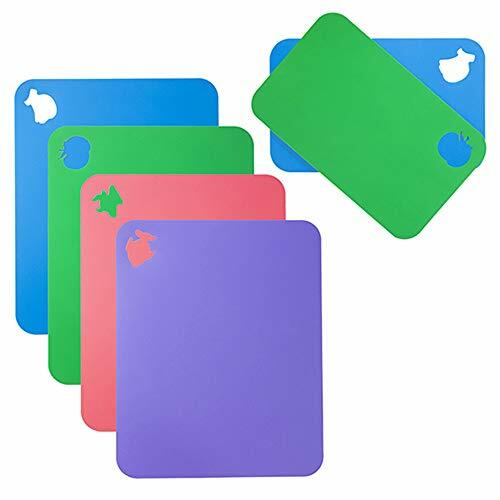 SET of 6 FLEXIBLE MATS: The color coded plastic cutting mat set With Food Icons prevents cross contamination for your family's safety, with Non-porous surface that prevents the growth of harmful bacteria. FLEXIBLE: Our flexible plastic cutting board mats(0.7mm thickness)are flexible to curl and fold easily for easy transferring of food to bowls or pans. Cutting Board Mats Set are also so stunning they could be used as place mats! TEXTURE NON-SLIP BOTTOM: Each cutting board has a crosshatch textured back, so the cutting board set will not slip on your counter-top! Cutting board plastic measure 14.5 by 11 inches/Big Size, 11 by 7 inches/Small Size and 0.7MM thick. Great for any kitchen, outdoors, picnic or camping. EASY TO CLEAN: Plastic Cutting Mats Made by environmental friendly material PP, are easy to clean under running water or in a dishwasher. 100% MONEY BACK GUARANTEE: We are sure you will love your new set of 6 cutting boards! If you're not 100% satisfied with our cutting board, don't hesitate to contact us.